Throughout this guide we will tell you how to choose which technology to use. Screen capture of an independent video hosting website. Organisations like WITNESS have worked hard to help YouTube and other commercial video-sharing websites distribute the work of social movements and other independent producers. 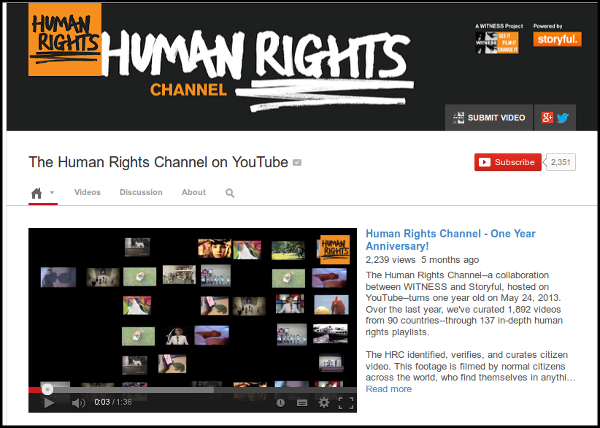 There is a dedicated Human Rights Channel on YouTube, which profiles key videos. However, the context in which you watch video is important. While YouTube can help bring an audience to your video, the business model of YouTube and other similar sites involves collecting and selling information about you and the people viewing your videos. If my videos don't show up in YouTube searches, will I lose out on viewers? If my video is very successful, will thousand of views crash our website? How can I deliver video in different quality levels responsively? We will deal with how to overcome or address these challenges step by step in many of the following chapters. The guide has a focus on using online video for positive social change and has been commissioned as part of the Human Rights Connect project of Internews Europe. The writers of this guide are Mick Fuzz, an active community member of the FLOSS Manuals project, and Anna Helme from EngageMedia. The writing is co-ordinated by the v4c.org network.